Gabriel visited Daniel to provide insight into his dream (Daniel 10) and also visited Mary to tell her of baby Jesus (Luke 1:26-56); and angels also appeared to John to bring the message of the Revelation of Jesus Christ. In these circumstances, the angels all took on a magnificent super natural appearance and were obvious to their recipients. But on other occasions God’s messengers have taken on a human form, blending in with those around them. In Genesis 18:1-18 Abraham noticed three strangers and welcomed them into his home and prepared for them a meal. Then they revealed to him the message from God that Sarah would have a son. Again in Genesis, 19, strangers were received by Lot into his home and not only made welcome but also protected. They then revealed God’s message to Lot that Sodom was going to be destroyed and he was to take his family and leave. 2. to be welcoming and hospitable to strangers. These are important instructions to receive together, because what enables us to open ourselves up and be hospitable to strangers is to love them like they are family – NOT strangers. ​How do we love strangers as family? He enables us to love others as He loves others. Abraham and Lot were first obedient to God, they displayed their love for God by obeying His commandment to love others; then they were given their message from God. Let us strive also to be obedient to God in loving others. And let us also be open, welcoming and hospitable to strangers around us. Let them see and feel God’s love through us. What are some ways we can show Christian hospitality to others? 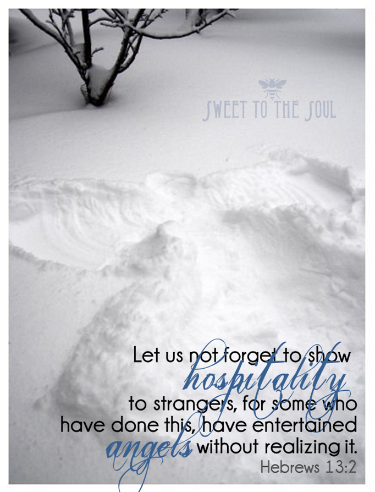 In what way has your life been touched by someone showing hospitality? I would love to hear from you, let's start the conversation below. If this topic has touched your heart, you might also enjoy Love Your Neighbor. This is a wonderful blog that speaks to the heart of the Gospel and Christ made flesh in the world! So often I fear welcoming strangers due to such evil in the world--can I trust this stranger in my home? Or like this morning, a man who smelled so bad sat next to me at the coffee shop. I judged before wondering if he might in fact be an angel. Thank you for your convicting post..my heart yearns to live your words. This Christmas season I'm in deep prayer about seeking and expressing the heart of Christ! This is an area where God continues to work with me. To place other's needs before my comfort. I so appreciate His patience with me!